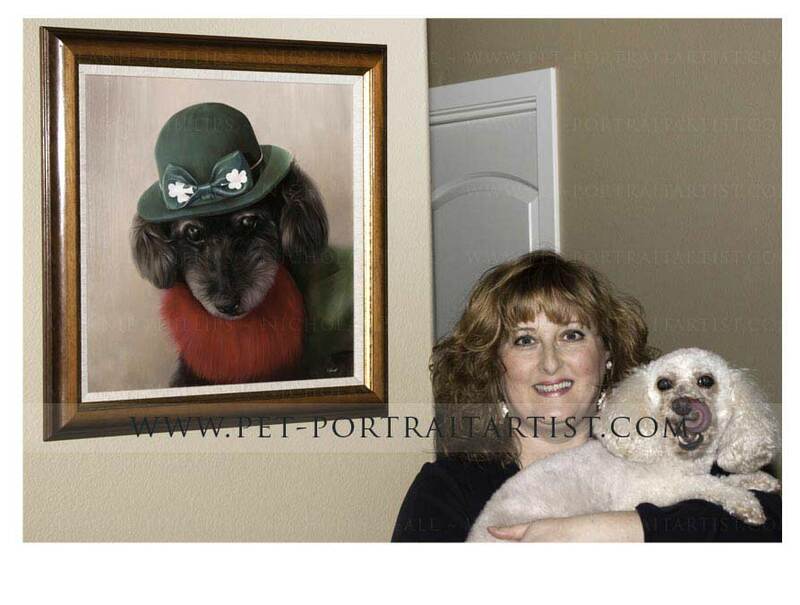 Tracy Maguire contacted Nicholas and myself in 2014 to ask if we would be able to paint a portrait of their dog Curly, a Poodle Mix, who very sadly passed away at the amazing age of 23. The portrait was painted by Nicholas in oils on linen canvas and framed by our Framer. 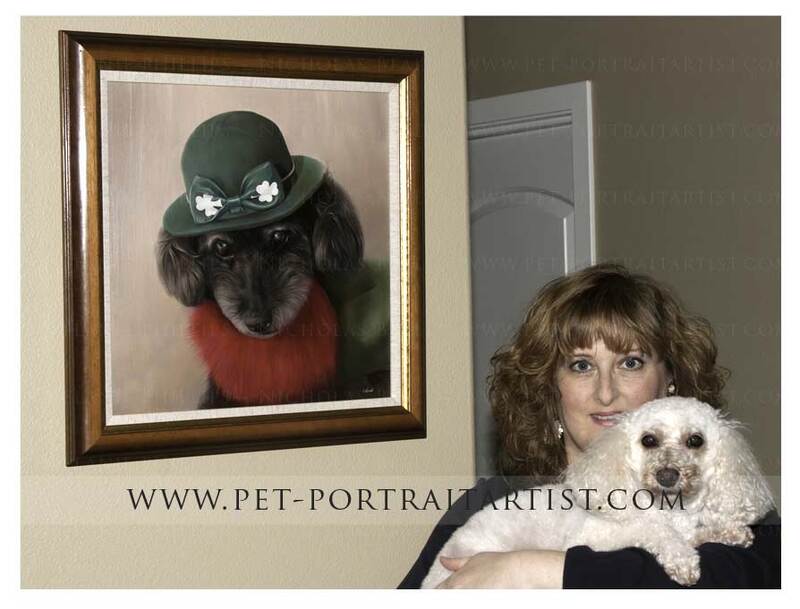 Tracy and her family were overjoyed when they received the painting and Tracy very kindly had some photos taken of herself, Curly's portrait and their current dog Sarah. We would officially like to thank Tracy and their family for taking these photos and allowing us to use them on our website. I have also enclosed a wonderful testimonial from Tracy which I hope our clients and visitors enjoy reading. It has taken me many weeks to be able to email you a proper 'thank you' for Curly's portrait. As you know, we received the portrait just two weeks after the day marking the first anniversary of Curly's passing and receiving the portrait was extremely emotional. When I opened the package and saw Curly's face, so lovely and warm, I was immediately overcome with tears. I thank you so very much for creating a stunning portrait of Curly. My family will cherish this portrait for the rest of our lives. You've also created a portrait which everyone who knew Curly, from our extended family of friends to the women who runs the rescue organization in California (The Brittany Foundation), that brought Curly into our life, can appreciate and admire forever. I'm pleased to attached two photos of Curly's portrait in situ: one in which our dog, Sarah, was dignified and the other........well, you'll see. Please feel free to post either photo and this written gratitude on your website. Thank you, again, for giving us a lovely portrait of our Curly.